This manual describes three procedures for quantitative estimation of bird populations: route, point and constant site (plot) censuses. Included are guidelines for the organization, preparation (establishing a route and site selection), census procedures, record-keeping and data processing. All three field study techniques (with associated international criteria) are approved by the International Committee in Bird Census. Determining which of the three census methods is most appropriate depends on the purpose of study, peculiarities of the study site, season, bird numbers, time availability and labor resources. The route method is used most often to obtain approximate data on numbers (relative density) of bird populations in different biotopes, when there is small or inconsistent sizes of field study sites and a number of skilled observers. Advantages of the route method include broad coverage of an area and seasonal and habitat universality (census can be carried out in any season and in any habitat). Disadvantages of the method are low accuracy of data on population density and the need for skilled observers. Point census is used for regular monitoring of changes in numbers of different (model) species in a highly mosaic landscape and when monitoring is carried out by amateur ornithologists who do not know birds well. Advantages of the method include methodical simplicity of the census technique and low demand on observers’ qualifications. Disadvantages are low accuracy of data on bird population density and the need to adhere precisely to a number of standards in the course of the census. Area mapping is used when it is necessary to obtain accurate data on absolute numbers (density) of populations of different bird species at a specific study site. Advantages of this method include high accuracy of data on bird populations density and the possibility to conduct simultaneous studies of territorial behavior of birds. Disadvantages of the method include; highly labor-intensive procedure, small sample of field study site studied and limited available time (usually nesting season). In this lesson students will learn all three census techniques as they implement each strategy simultaneously at the same study site. This approach allows students to each conduct census as well as compare the effectiveness of the strategy, i.e. efficiency, accuracy and labor intensity. Any forested area is suitable including dense forests, gardens and parks, shrubbery thickets both in mountains and on a plain. Dense forests on steep slopes or completely open space will make these field studies difficult. It is advised to choose a forest (or a site covered with vegetation) which is minimally disturbed by human activity and which is not less than one square km in size. 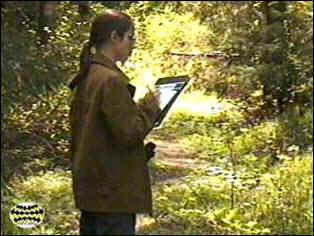 Route and point censuses require lengthy sites while plot census can be carried out at a limited forested site. We recommend to conducting these studies at the same site where route censuses of birds were carried out in fall (Autumn Lesson #7). It is then possible to compare characteristics of bird populations during non-nesting and nesting seasons. Students must be able to recognize bird species by their appearance and singing in the course of any quantitative censuses of birds. Students will be estimating the numbers of birds including birds seen at long distances and birds singing without actually being seen. Students will need to determine the distances to birds and distances covered. Thus, special attention should be paid to training of students while preparing for implementation of the studies.